One of the problems troubling the UK electricity industry is how to deal with domestic evening ‘peak’ demand, especially in winter. From a DEMAND point of view this means we need to understand what happens during the evening period. If we know what practices lead to the emergence of ‘peak’ then we might be able to think about ways those practices could be re-configured to avoid costly local network reinforcement and/or the use of carbon (and cost) heavy back-up generation capacity. 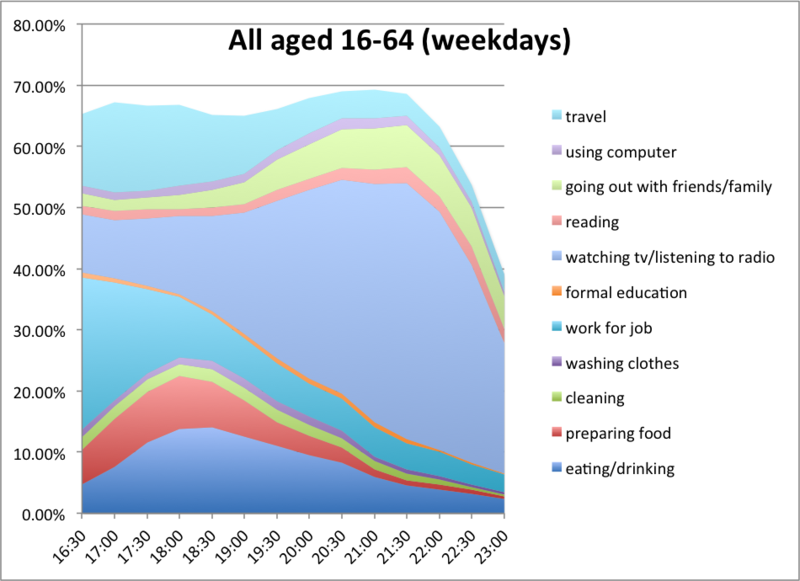 We’ve therefore been looking at recent UK time-use survey data to see what makes up ‘peak’ and one of the things that struck us were age-group differences in the timing of early evening activities. 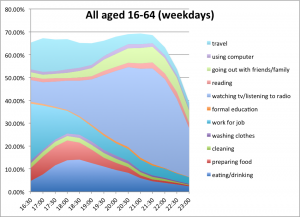 As the charts show, those aged 16-64 have a rather diffuse early evening as work or study and its associated travel tail off into eating and drinking. In contrast those aged 65+ have a very distinct, and therefore synchronised, early evening pattern of cooking and eating followed by extensive TV or other media use. 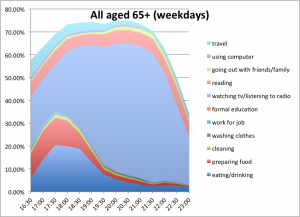 If nothing else this analysis reminds us that the 65+ age group’s freedom to choose, through a presumed lack of labour market constraints, does not manifest as varied dinner times. Rather, the lack of constraints enables an apparently fixed dinner time, and thus peak cooking ‘demand’, to be observed. In contrast the ‘randomising’ and thus smoothing effects of a combination of labour market and travel constraints for those aged 16-64 may act to diffuse demand. This entry was posted in Data Bytes and tagged dinner, energy demand, peak demand, Theme 1, time use. Bookmark the permalink.